Two deadly collisions involving U.S. Navy destroyers in June and August 2017 cost the lives of 16 sailors, leading the Navy to declare a day-long operational pause to reflect upon its safety culture. That such similar accidents took place in such close proximity reflects stresses and failings common to the maritime fighting branch. Indeed, the recent spate of collisions echoes a succession of even more catastrophic accidents aboard U.S. aircraft carriers between 1966 and 1968 that between them claimed the lives of more than 200 sailors. These incidents were the result of a Navy taxed by the enormous demands of the Vietnam War. In their wake came major reforms addressing the inherent dangers of operating ships packed full of explosive munitions, fuel and jet planes. This three-part series will examine why each of the accidents occurred, how the crew responded and the lessons that were drawn from the tragedies. In July 1966, the USS Oriskany deployed for its second tour in Vietnam at Yankee Station, a point in the Gulf of Tonkin roughly 100 east of Da Nang. 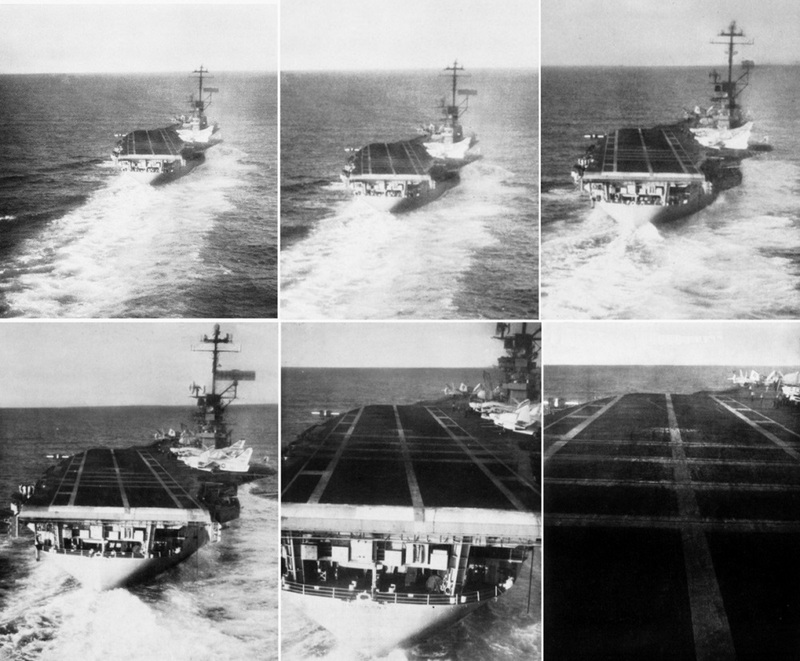 The 900-foot-long Essex-class carrier was one of several rotating there to serve as floating air bases for nearly continuous airstrikes over Vietnam. She had been launched at the end of World War II, commissioned and served in the Korean War. Now her five combat squadrons — including A-1 Skyraider propeller planes, as well as F-8 Crusader and A-4 Skyhawk jets — would fly nearly 8,000 combat missions in four months. By October, the Oriskany’s air wing was nearing exhaustion, as its pilots were flying two missions a day. On Oct. 1, Defense Secretary Robert McNamara visited the carrier and upbraided Capt. John Iarrobino when he learned that the air wing was not adhering to Pentagon guidelines stipulating that pilots should not fly more than 1.5 missions per day. The Oriskany’s skipper replied that there simply were not enough airplanes and crew to meet the demands expected of them any other way. Weeks later, on Oct. 26, 1966, two apprentice airmen were stowing an unexpended magnesium flare into locker A-107-M when something went wrong. The roughly three-foot-long Mark 24 Mod 3 cylindrical flares were usually dropped by parachute during night operations to illuminate targets with their two-million-candlepower glow. A wire lanyard taped to the airplane was used to trigger the flare — but after being carried on a combat mission without being used, the lanyard’s safety had not been reset. At 7:28 a.m., one of the airmen apparently dropped the flare, either triggering the lanyard or causing the flare to spontaneously combust due to a design flaw. Either way, the airmen panicked and did precisely the wrong thing — they tossed the burning flare into the ammunition locker and locked it up. Locker A-107-M, located on the hangar deck just next to the carrier’s forward elevator, held more than 250 flares and numerous 2.75-inch folding-fin FFAR rockets. The burning magnesium caused one of the rockets to explode, starting a fire — which in turn caused the chain combustion of all of the remaining flares. When a firefighting crew raced below deck to drown the flames in fire-retardant foam, they discovered the 5,400°F blaze had warped and melted the door closed. The deck grew dangerously hot, and flames had spread through one of the walls. The firefighters could only desperately attempt to cool off the surrounding deck with their hoses. After five minutes, the pressure built up by the blaze finally blew open the doors in a tremendous fireball, spreading flames across the hangar. This in turn caused a liquid-oxygen tank near the elevator to ignite, setting a UH-2 helicopter on fire and triggering the ejection seat on a Skyhawk jet, causing the canopy to ricochet across the hangar. 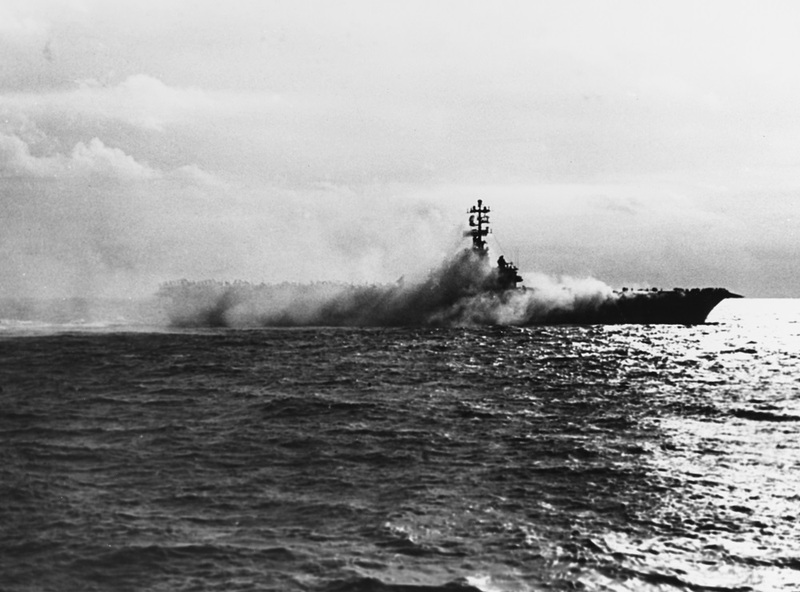 Thick clouds of smoke were sucked into the ventilation system, smothering the forward third of the Oriskany, fatally searing the lungs of many crew members and suffocating others. The officer’s quarters were especially hard hit. Lt. Cdr. Dan Strong, resting in his state room, was the first to fall victim. A remarkable article by Don Moser in Life magazine recounts the ordeal of some of the survivors. Trapped in his personal quarters as fire licked under the door, Lt. Cdr. Marvin Reynolds wrapped himself in a wet blanket and breathed out of a porthole he had wrenched open, until a sailor outside provided him with a breathing mask and a firehose. Cdr. Richard Bellinger, squadron leader of the Oriskany’s Crusader fighters, found himself in a similar situation. He stripped out of his clothes and managed to squeeze himself through a porthole onto a raised walkway. Meanwhile, Bellinger’s executive officer Cdr. Charles Swanson and two ensigns managed to rescue 10 other officers from their quarters, one of them severely burned. This party was forced to flee even deeper in the ship as fires raged on the deck above them, and ultimately took refuge in a seven-story-deep void in the ship used as a storage space. The terrified sailors had to endure the lights flickering out and the oxygen supply depleting until Swanson finally found a path out through dark, twisting, smoke-filled corridors — and then had to head back into the smoky cavity three times to lead out the men behind him. Meanwhile, a frantic damage-control effort took place to shift the numerous aircraft, bombs and cans full of jet fuel away from the expanding flames. Crew members began teaming together to pitch 500-pound bombs over the side of the deck. Others hosed down bombs already sizzling from the fire’s heat to keep them from cooking off. Aircraft were hastily taxied onto the elevator and lifted onto the safety of the flight deck; two burning helicopters were rolled overboard. The Oriskany’s Damage Control Center collected reports and dispatched teams to contain the growing conflagration, even as water from the fire hoses began to drip into their compartment. Rescued efforts proceeded apace. A helicopter plucked three men who fell overboard from the water. Two Skyraider pilots with breathing masks ventured multiple times into smoky corridors, dragging out unconscious and dead crew members from their bunks. The badly injured were medically evacuated to nearby carriers. Finally, after three hours of frantic firefighting, the blaze was deemed under control at around 10:30. Smaller fires would continue until after 3 p.m. Forty-three of the ship’s crew had died from asphyxiation, and one more succumbed to burn wounds; among the dead were 25 pilots from the Oriskany’s air wing. A further 156 crew members were injured. In terms of material damage, two helicopters were lost, as was an A-4E jet, while three more Skyhawks were severely damaged. The Oriskany itself retired to San Francisco for five months of repairs costing about $13 million ($100 million adjusted for inflation), before sailing back for another combat tour in June 1967. The disaster on the Oriskany seemed attributable to human error while handling the flares. The Navy court-martialed five sailors, charging them with 44 counts of manslaughter. Those indicated included the two apprentice airmen, as well as the chief of the ordnance section — blamed for having left the inexperienced sailors unsupervised. However, new considerations led to acquittals across the board. Apparently, a defect in the Mark 24 flares made some of them susceptible to igniting when jarred. The Oriskany’s skipper, Capt. John Iarrobino, later complained that the Navy had been hasty to blame his crew, arguing that true fault lay with the manufacturer of the flares. The sailors aboard the Oriskany reacted swiftly and courageously to rescue vulnerable crew members and prevent the fire from spreading. Nonetheless, the incident was a timely warning of the danger of overworking a crew beyond the limits of its manpower; it also demonstrated the vital importance of ensuring that munitions were properly designed with high heat tolerances to avoid accidental detonation. The crew of the Oriskany were fortunate that their damage-control measures averted a further chain detonation of the many bombs and fuel stores scattered across the hangar deck, which could well have destroyed the ship. Unfortunately, the risks posed by faulty munitions were not properly appreciated, and an even more catastrophic incident would occur on the supercarrier USS Forrestal just nine months later.